Here you will find our entire selection of accessories and spares for our range of curtain tracks and rails we sell here at Poles and Blinds. 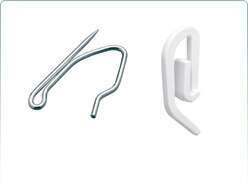 We supply all accessories ranging from extra track gliders and curtain hooks to curtain track brackets and track cording kits. Gliders for curtain track come in various shapes and sizes, each glider is designed to fit a specific make and model of curtain track and are sold in packs with the quantities supplied stated on each product page. Extra track gliders may be needed depending on your curtain heading, if the top of your curtain is sagging between each glider then your curtains require extra support and extra gliders should be purchased. 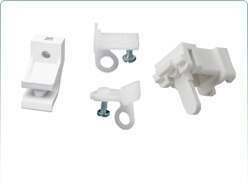 All curtain track brackets within this section are for existing curtain tracks we supply here at Poles and Blinds. All curtain tracks are supplied with the correct number of brackets for the particular length of track you have chosen, however if you feel the wall isn’t substantially strong enough then extra support brackets can be added to the key areas of your track. 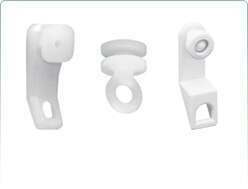 The stop ends we supply are spares for the existing curtain tracks we sell here at Poles and Blinds. Stop ends simply slide onto the ends of each curtain track to prevent the curtain track gliders from falling off and out of the curtain track. Hooks for curtains are available in different shapes, sizes and materials including nylon, plastic and metal. Curtain hooks hook into the heading tape of your curtains and then each hook threads onto a curtain ring or a glider, allowing your curtains to hang and operate on a curtain pole or track. Our track cording kits allow you to upgrade your cordless track into a full corded system so your curtains operate by pulling the cord rather than opening and closing by hand. 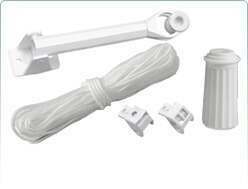 Each cording kit is designed for a specific make and model of curtain track.